Lee Bowyer scored the only goal of the game against his former club to secure Birmingham's place in the top half of the Barclays Premier League and increase the relegation worries of a West Ham side who had Mark Noble sent off in the closing stages. The 32-year-old midfielder, who made the permanent switch from Upton Park in the summer after an initial loan spell, settled the match with his sixth goal of the campaign. It enabled City to record a fourth successive league win and equal their best top-flight run for five years and since the Steve Bruce era. Bowyer, to his credit, did not indulge in any undue celebrations after breaking the deadlock with his third goal in the last four games. But he would have taken immense pleasure from his actions after becoming surplus to requirements at Upton Park. Birmingham were the dominant side for much of the game, with Barry Ferguson again impressing in the centre of the park. But they had to survive a late onslaught and were indebted again to some rock solid defending from Roger Johnson and Scott Dann before claiming the points. Bowyer won the game's first corner and, from Sebastian Larsson's cross, the home side came close to taking the lead. Johnson got on the end of Larsson's near-post ball and his first time flick forced an excellent close-range save out of Robert Green. Liam Ridgewell was first to react to the rebound but his shot was blocked. Radoslav Kovac became the first player to be yellow carded after a challemge on James McFadden. Then Ferguson was booked after 16 minutes for kicking the ball away after West Ham had been awarded a free-kick. Bowyer got n the end of a low cross from Cameron Jerome after starting the move himself but he failed to make proper contact on his shot which flew wide of the far post. West Ham came more into the game after the half-hour mark and Alessandro Diamanti twice went close in the space of 30 seconds. First he drilled a powerful shot into the side netting and then was only just wide with a swerving effort from the edge of the box. 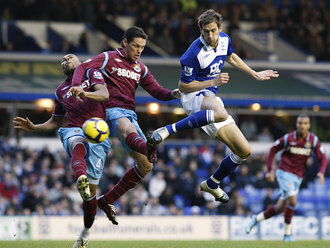 Ferguson was again impressing in the centre of the park for Blues and a superb pass picked out the run of Benitez. But Green was alert to the situation and came out to block his shot and also the rebound attempt from the Ecuador international. Junioe Stanislas was adopting a shoot-on-sight policy and Joe Hart went down to his right to keep out a long-range effort which took a slight deflection. But Jerome should have done better in first-half injury-time when heading over from a Ridgewell centre. Stanislas was booked with seconds remaining of the half for hauling back Benitez. Benitez had the ball in the net after a minute of the second period but he had strayed a yard offside. After 52 minutes Bowyer broke the deadlock. Jerome and Benitez combined before the ball was threaded through to Bowyer and he drilled the ball past Hart from 10 yards out. The 32-year-old was mobbed by his team-mates but only indulged in only the minimum of celebrations after scoring against his former club. Birmingham came close to doubling their lead when Benitez released Jerome in space inside the box and his rising shot was turned aside for a corner by Green. Ridgewell then turned the ball wide at the far post after Jerome had flicked on another dangerous inswinging free-kick from Larsson. Hart diverted a low shot from Diamanti around the post before the visitors made a double change, bringing on Kieron Dyer and Jack Collison in place of Kovac and Stanislas. Dyer almost made an instant impact, cutting in from the left flank and seeing his shot crash against the far post. Noble was booked for a push in the back on Bowyer and Johnson followed him into the referee's notebook for a challenge on Dyer. The Hammers were reduced to ten men after 79 minutes when Noble brought down Benitez and was dismissed for a second bookable offence. Hart denied Guillermo Franco after he had been put clear by Scott Parker and at the other end Jerome found himself one on one with Green but shot wide. Birmingham Hart, Carr, Roger Johnson, Dann, Ridgewell,Larsson, Ferguson, Bowyer, McFadden (Phillips 90), Jerome,Benitez (Fahey 90). Subs Not Used: Maik Taylor, McSheffrey, O'Shea, Carsley, Vignal. Booked: Ferguson, Ridgewell, Roger Johnson. West Ham Green, Faubert, Gabbidon, Tomkins,Ilunga (Nouble 83), Stanislas (Collison 69), Parker, Noble,Kovac (Dyer 68), Diamanti, Franco. Subs Not Used: Kurucz, Spector, Da Costa, Payne. Booked: Kovac, Diamanti, Collison, Noble.